Question: Should I Feed My Bird Seeds or Pellets? Answer: The short answer to this question is that it's okay to feed your pet both seeds and pellets, but neither should be fed exclusively. However, seed and pellets should not be the only thing you should feed your bird. Birds need a wide spectrum of natural, healthy food. Seeds are deficient in calcium and vitamins. An all-seed diet simply cannot provide them with everything they need in their diet. Bear in mind as well that the quality of seed put out in the pet bird market is usually very low. Feeding an all-seed diet is not only unhealthy, the quality of a bird's life on an all-seed diet is not good. Raw vegetables. leafy greens, root vegetables, grains, nuts and healthy cooked food should be a large part of their diet. An all seed diet can lead to disaster. Seed is high in fat and if you feel the need to feed seed, learn how to sprout them before serving them to your bird. The process of sprouting burns off the fat which is what causes the damage to their health. Sprouting seeds burns off the fat found in seed that gives the seed the energy to turn into a plant. Once the fat is burned off, it is transformed into a live and highly nutritious food. It is a terrific food to feed your birds. It's easy to learn how to sprout and the process is safe for your birds once you learn to do it properly. Sprouts are a natural food that is in no way processed. Many people in the field of aviculture who have had decades of experience advocate sprouting and feeding the sprouts to companion birds of most species. Birds in captivity often do not get the variety of foods that they would in the wild and can't get all of the nutrients that they need from seeds or pellets alone. While pellets usually provide more balanced nutrition than seeds do, a pet bird's diet should be supplemented with plenty of fruits and vegetables to make sure that they are consuming all of the vitamins, minerals, and nutrients that they require. The wider the variety of both raw and cooked food, the better. Malnutriton is the leading cause of companion bird mortality. And most of the birds who suffer from this malnutrition were fed a diet that included only seed. This is such a shame as it is easy to learn to prepare healthy and delicious meals for your birds that are nutritious and provide them with a balanced diet full of the ingredients needed to maintain an active and healthy life. For many people this may sound difficult, but it isn't. You can make feeding your bird easier by learning to make Chop as well as making Grain Bake. As a rule, a bird should be fed a quality commercial pellet as a staple diet, and should be offered fruits, veggies, and greens daily, with a few seeds thrown in now and then as a treat and to add variety. Nuts are a nutritious and satisfying treat and really should be included in their diet. Nuts contain Omega 3 fatty acids, and many much needed minerals and powerful antioxidants that help their bodes fight dangerous free radicals. Make sure not to let your pet eat too many seeds. They are like junk food to birds and some of our feathered friends may refuse to eat anything else if they eat a seed only diet, leading to health problems and a shortened lifespan. 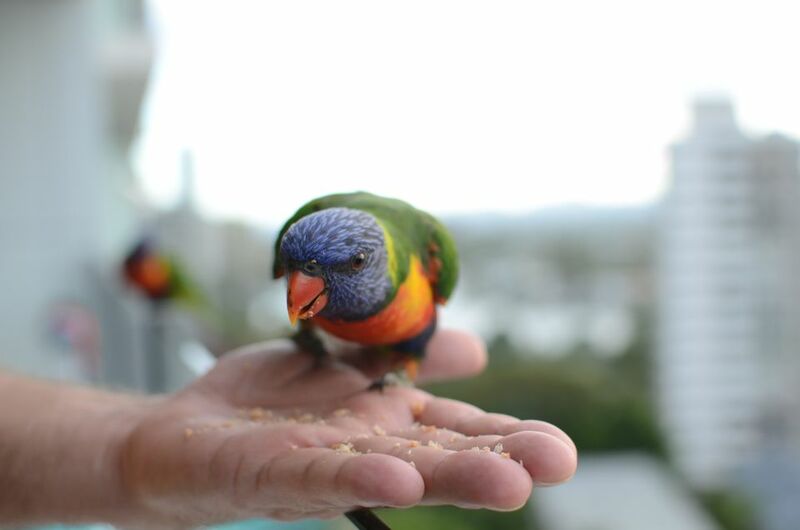 By making sure that your companion bird eats a healthy and varied diet, you will help guarantee that your bird will be around for you to enjoy for many years to come. Remember that the old saying "You are what you eat" applies to pet birds too! Make sure that your bird is at his or her best by feeding a top-notch foods that will keep him looking and feeling great.